Steve McDougal was working in Chicago in the late 1990s when he had a life-changing experience, one unrelated to the dot-com crash that had begun monopolizing headlines and serving as the uninvited catalyst for legions of career changers. 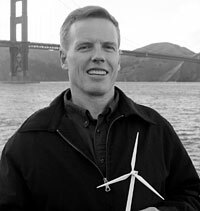 The 1995 Kellogg alum read Mark Hertsgaard's Earth Odyssey: Around the World in Search of Our Environmental Future, which outlines how the United States is insulated from worsening environmental conditions worldwide. "We Americans don't often consider how our purchasing and consumption drains natural resources required to deliver our products from other countries," says McDougal, noting that some 25 percent of global emissions comes from the United States. "We have been really weak on the biggest issue, global warming, which we are a leading cause of with our massive carbon dioxide emissions --- a pollutant we don't regulate." Leaving aside the larger environmental impact, the potential human and property costs from global climate change run into the tens of billions, notes McDougal. McDougal took Earth Odyssey to heart, including this advice: "The answer begins with you. Not everyone else --- you." Over the next four years, he discovered how to combine his environmental interests with his business interests. McDougal, 38, is manager of the renewable certificates division for 3 Phases Energy Services, a 13-employee firm with a branch office on the old Presidio military base in San Francisco. The firm develops and distributes low-cost renewable and environmentally respectful energy solutions, sometimes called "green power." His job is part sales, part education and all passion. McDougal says: "I'm bringing the right combination of business issue awareness with a passion to make this vision successful and make renewables a much bigger part of the energy mix. And all day long I get to talk about something I love." McDougal pitches the idea --- that being good environmental stewards makes business sense --- more than a specific product. He says, "My biggest problem isn't competition, it's education." Renewable energy certificates (RECs) are a way for mainstream energy consumers to support power generated by resources such as wind, sun and smaller hydroelectric plants. "Renewable power facilities generate and sell RECs as a revenue stream in addition to the revenue from selling commodity electricity," says McDougal. "The sale of RECs, via 3 Phases Energy, to end user companies provides the additional cash flow required for the renewable energy project to be financially viable over its lifetime and provides incentive for additional development." Already, companies such as Kinko's and Lockheed Martin are 3 Phases clients. Plastikon, a major player in the plastic molding industry based in Hayward, Calif., has recently signed on. "You think that electricity is generally a pretty clean thing until you find out what's usually behind it," says Kaveh Soofer, director of operations for Plastikon. "Steve's suggestion to offset our emissions by supporting renewable energy was a good fit," says Soofer, noting that Plastikon is a major supplier to automaker Toyota. McDougal says the costs of offsetting energy use with even a small percentage from green energy sources are relatively small. "It can be as low as 1 percent incremental cost," he says. "A major corporation can essentially make an enormous environmental impact and have a marketable national renewable energy strategy for relatively little cost." McDougal lives in Mill Valley, a 15-minute commute via the Golden Gate Bridge. A devoted family man, he is married to Kellogg alumna Jan (Petersen) McDougal '95, and they have two preschool-aged boys. Growing up in Evanston and graduating with a degree in economics and political science from Colorado College, McDougal worked in commercial real estate in Chicago before entering the Kellogg School, where he studied marketing and finance. After Kellogg, he worked in software and consulting, and then spent four years at CNET Networks. Scott McCarthy, a Colorado College friend and executive vice president at ABC Radio Networks in Los Angeles, sees 3 Phases as a good fit. "The challenge Steve faces is that a lot of corporations will pay lip service to what he's doing," says McCarthy. But he sees McDougal succeeding because "it's something he's passionate about and committed to."